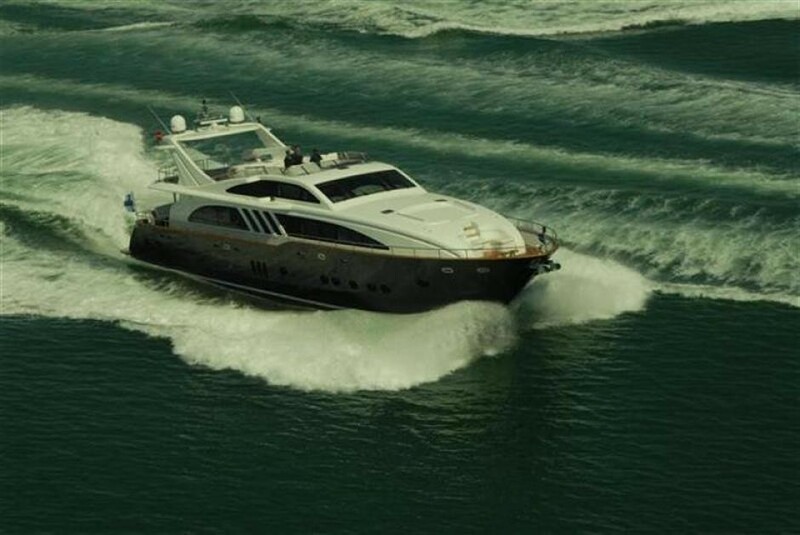 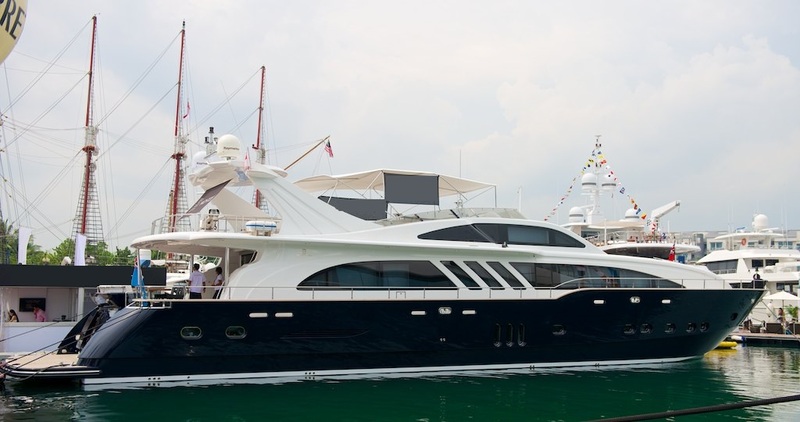 BLUE SAPPHIRE was built by Elegan Yachts of Istanbul, Turkey in 2009 and is a 30m (98ft), Giant 100 model. 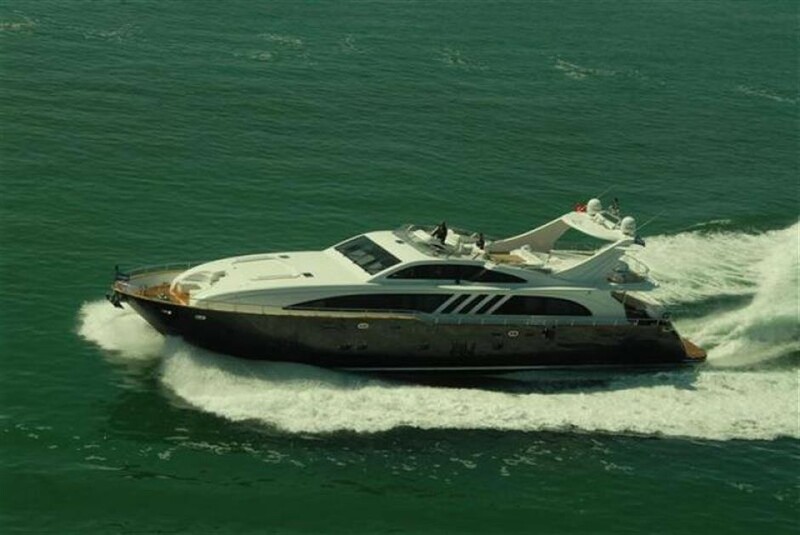 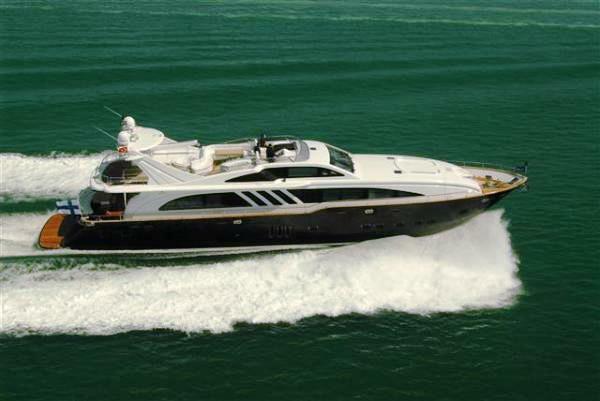 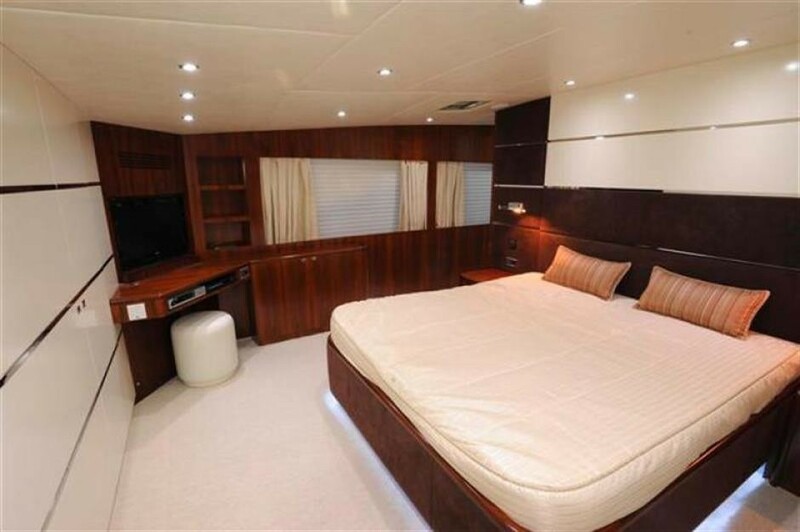 She offers spacious accommodation for up to 10 charter guests in 5 deluxe, en-suite cabins. 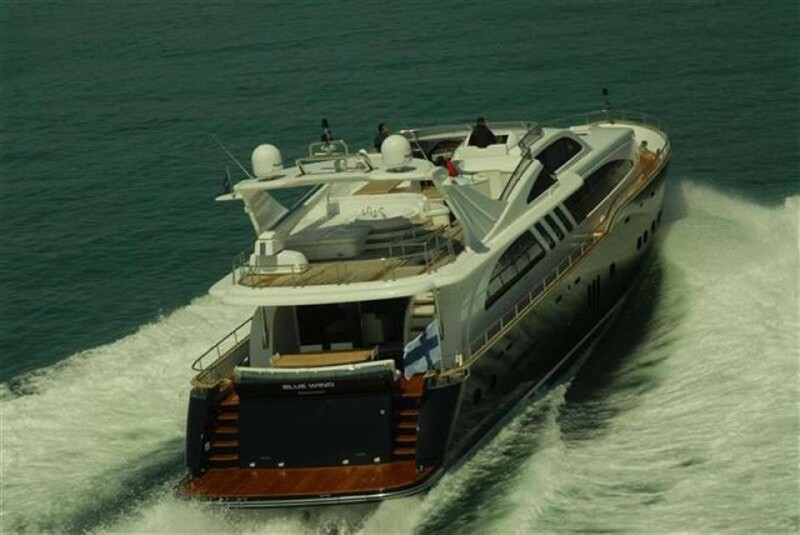 BLUE SAPPHIRE'S NOTABLE FEATURES: Spacious, modern and cosy interior ~ Vast aft deck ~ Extended swim platform ~ Great Flybridge with deluxe Spa pool tub and wet bar ~ Fantastic selection of water toys. 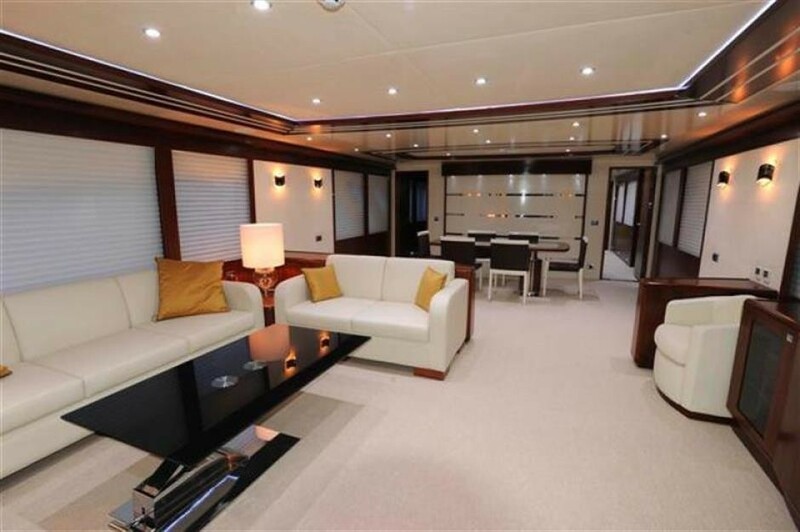 Featuring ample relaxing interior spaces and a generous exterior layout, BLUE SAPPHIRE is the ideal choice for groups of friends and families alike. 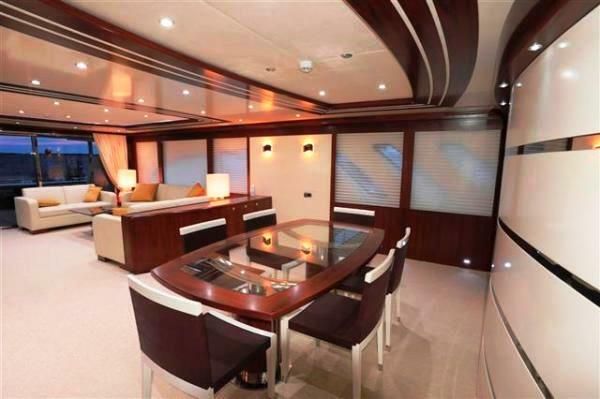 She boasts a tasteful contemporary interior. The salon and dining are an open plan, separated only by a modern low island credenza. 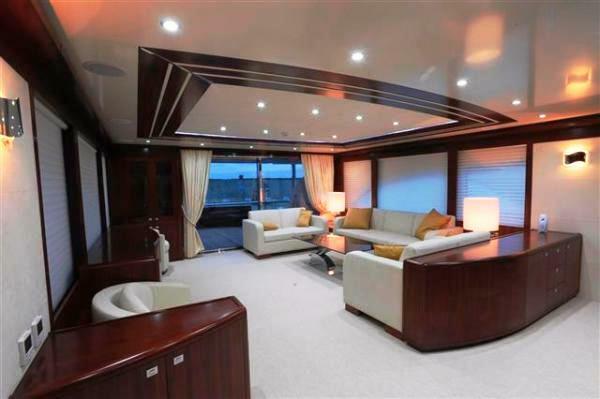 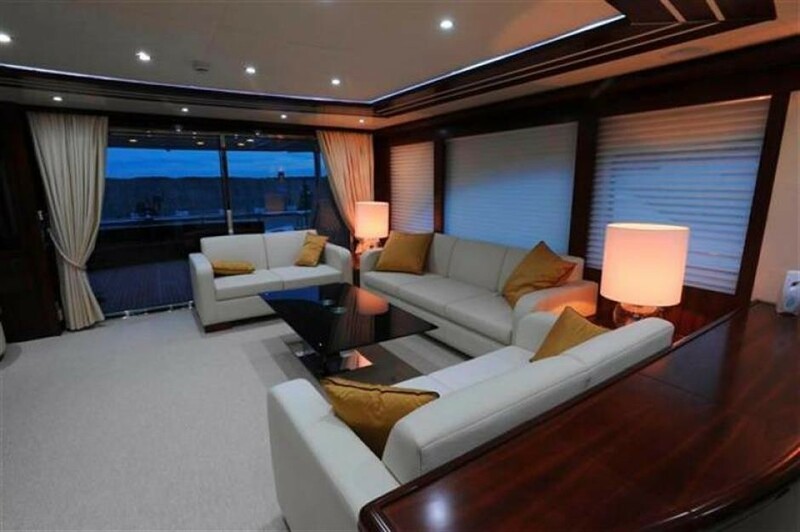 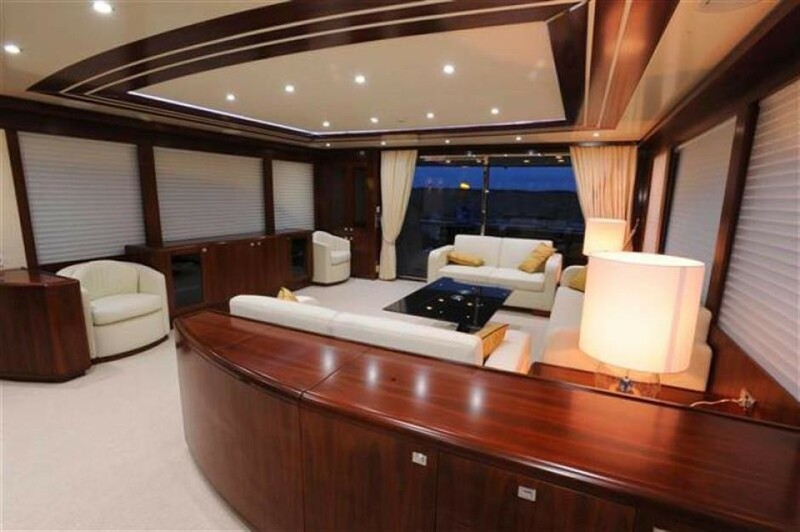 The lounge area offers plenty of plush seating, full entertainment systems and direct access to the aft deck. 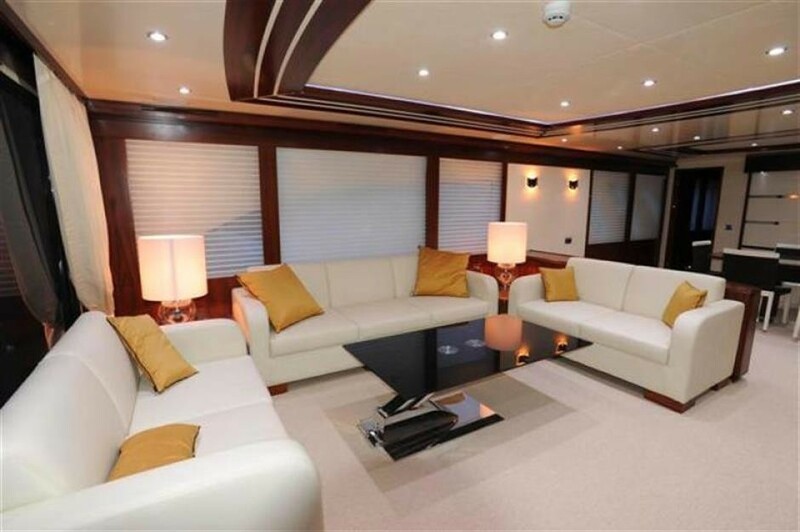 Forward, the formal dining space seats guests in elegance and style. 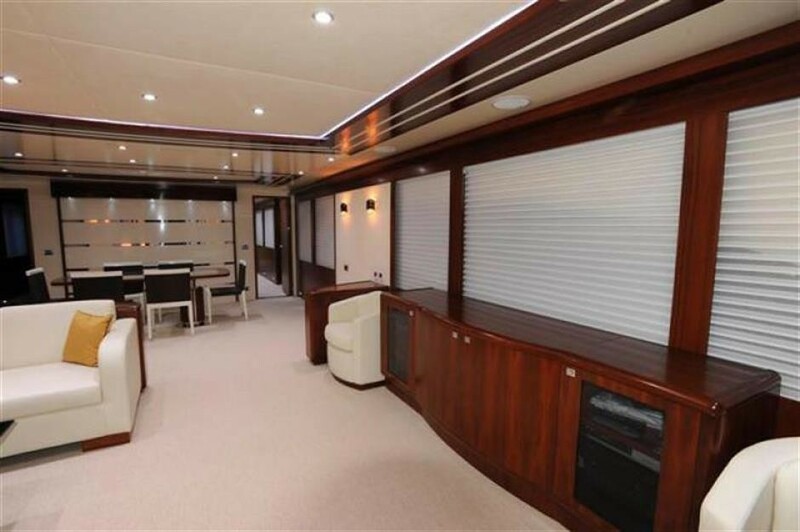 Surrounding panoramic windows allow warm natural light to enhance the spacious ambiance. 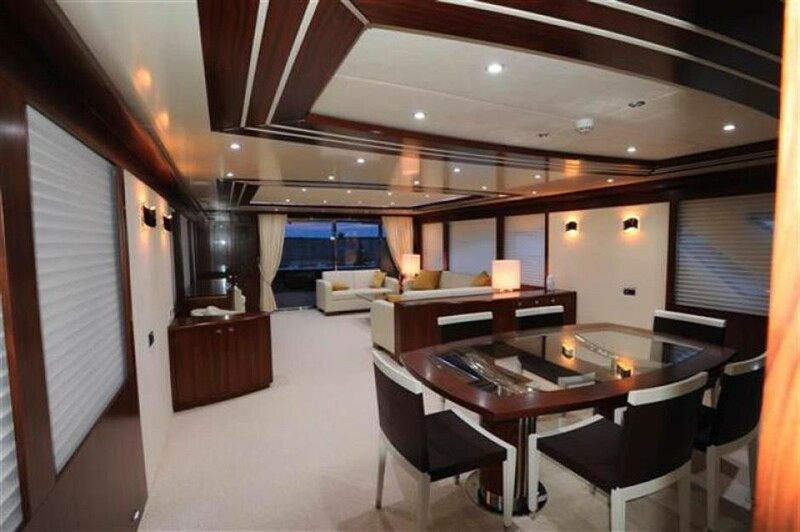 BLUE SAPPHIRE has plenty of exterior deck areas to make the most of the stunning locations she cruises. 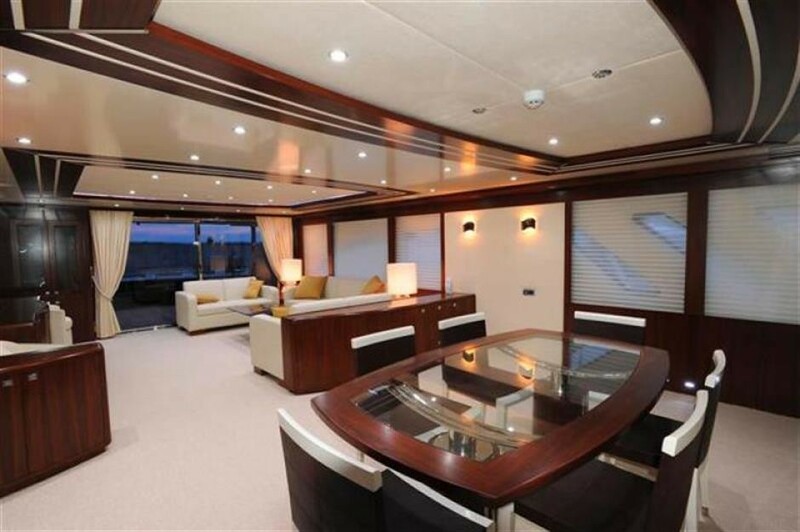 Aft of the salon and dining is a spacious aft deck, complete with shade, ample seating and an alfresco dining option. 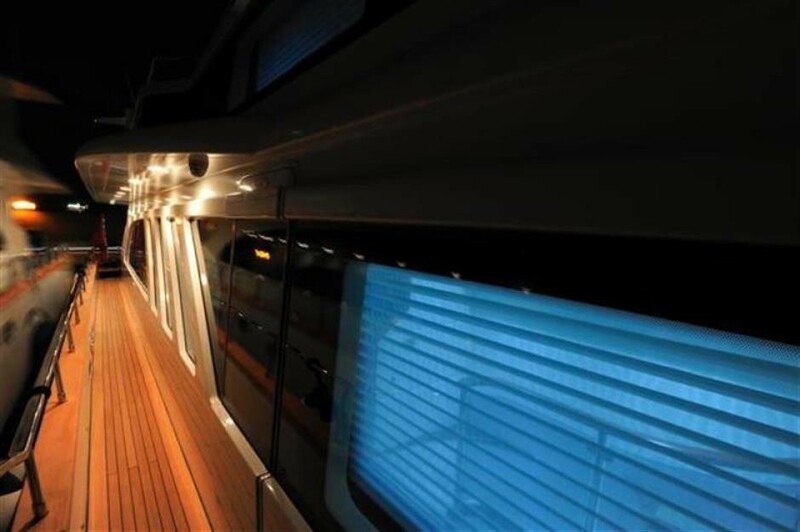 Further aft, the extended swim platform allows guests effortless water access. 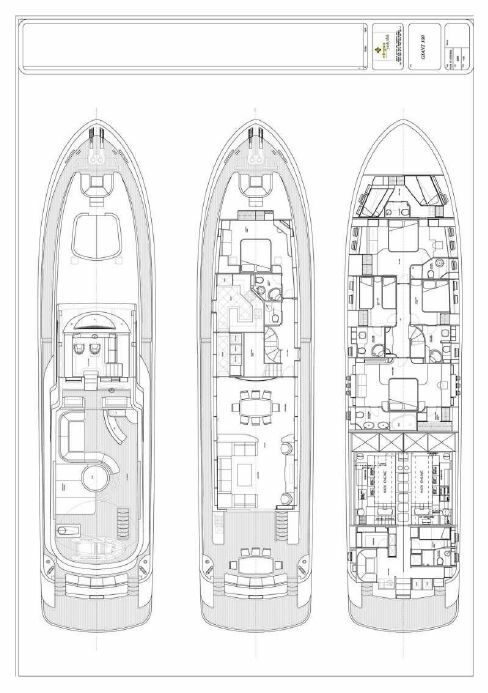 The main deck aboard the BLUE SAPPHIRE motor yacht wraps around in 360° and meets on the foredeck, where there is an intimate seating area and large raised sunpad. 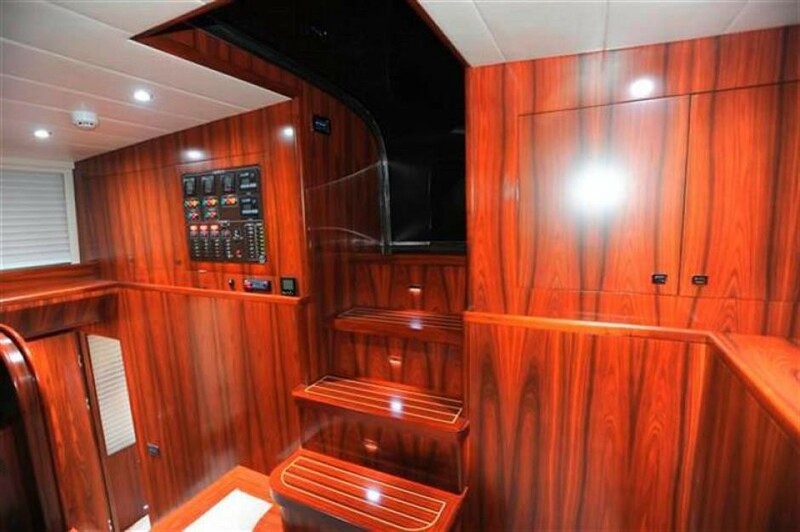 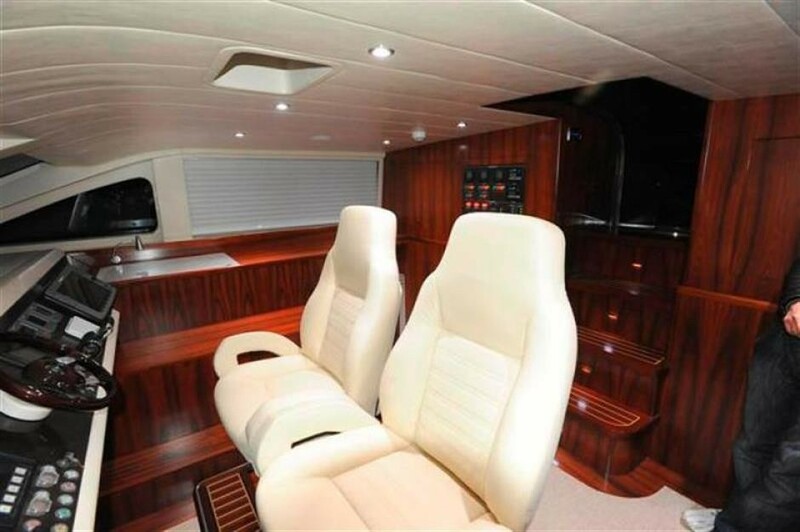 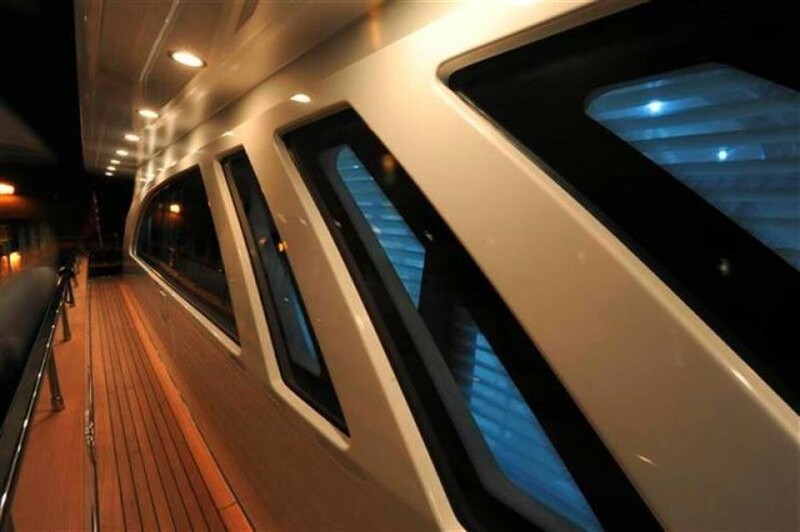 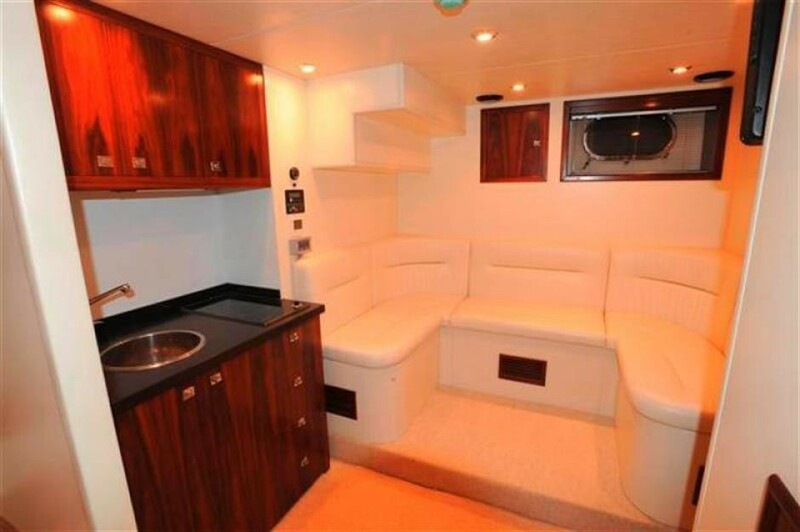 There is a superbe upper deck which can be accessed from the interior pilot house, or exterior aft deck. 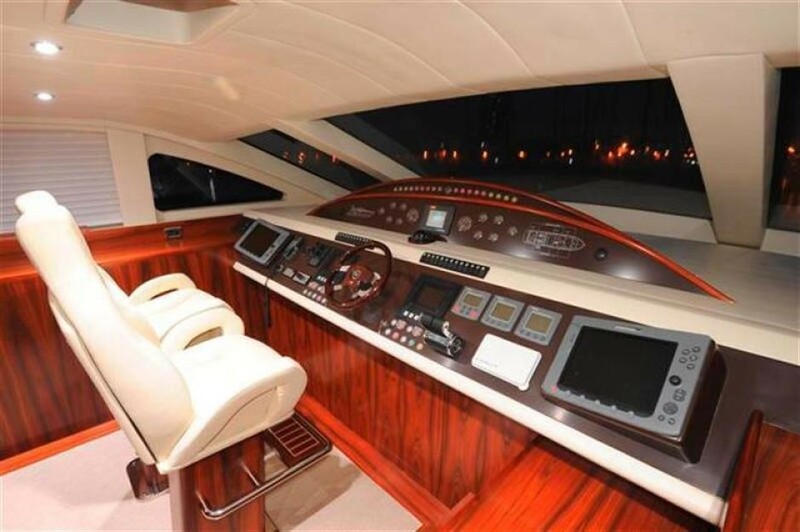 The Flybridge is perfect for socializing with friends and family. 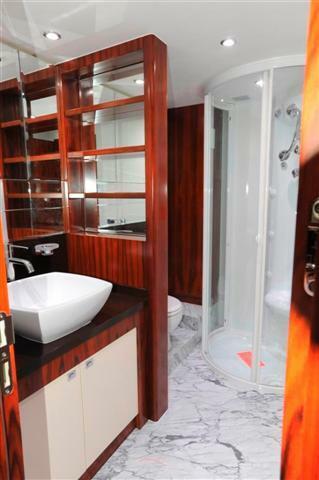 Take in the sights from your own deluxe Spa Pool tub, soak up the sun on the sunpad, dine alfresco or enjoy a refreshing aperitif from the fully equipped wet bar. 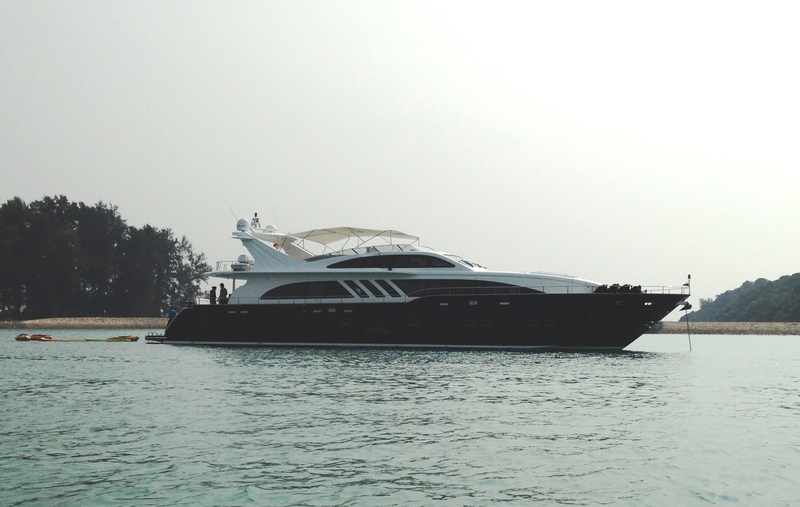 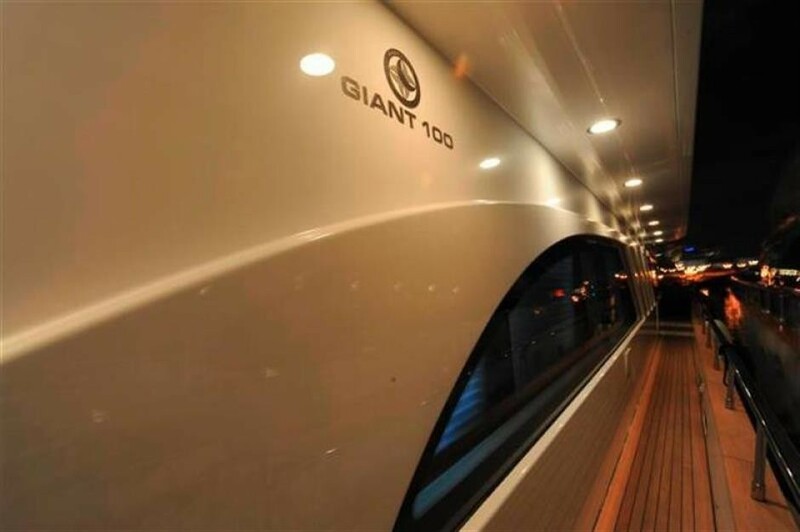 This Giant 100 yacht has a GRP displacement hull, her beam is 7m (22.9ft) wide, while her draft is 2.6m (8.5ft) deep. 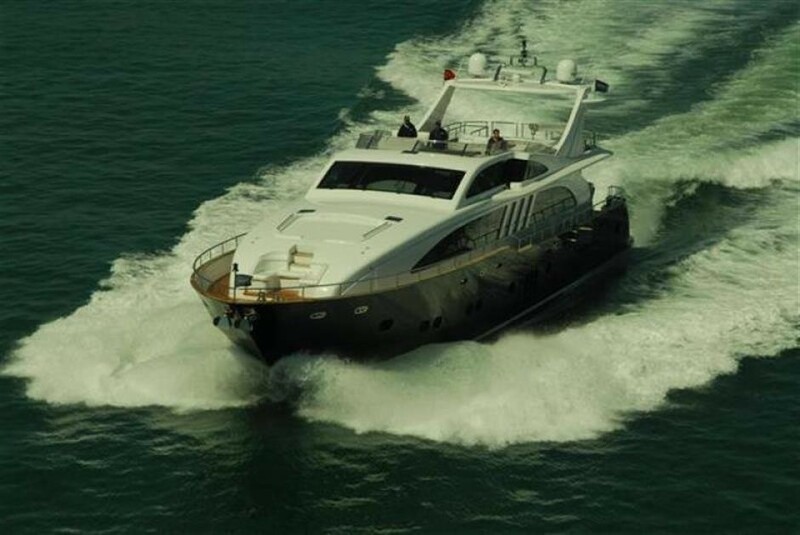 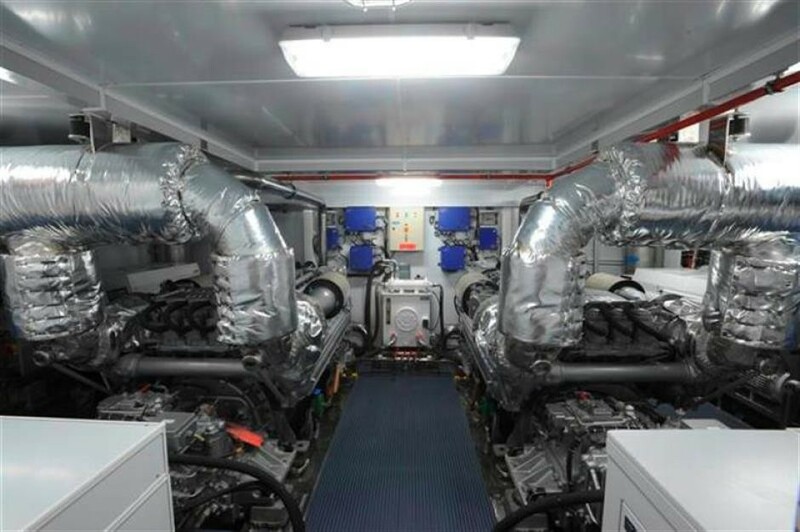 She is powered by 2 x MTU engines with 2000hp, and cruises at approximately 18 knots whereas she can reach top speeds of 30 knots. 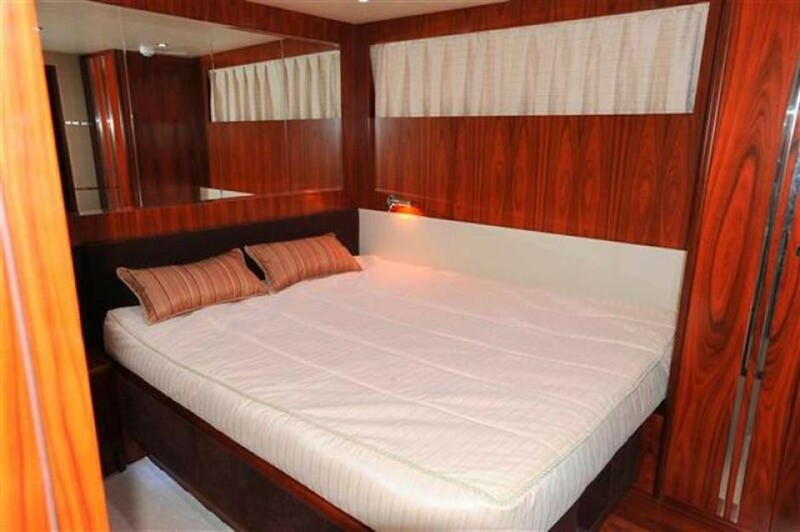 Accommodation consists of 5 generous en-suite cabins for 10 guests. 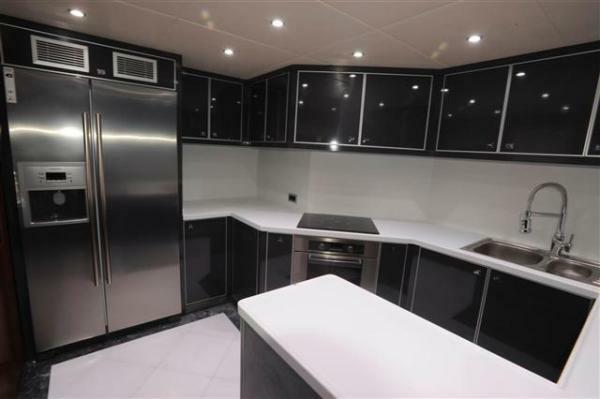 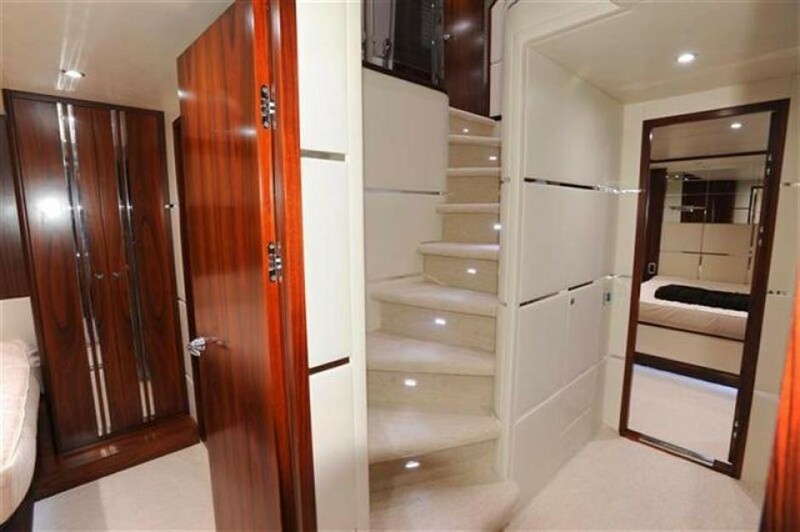 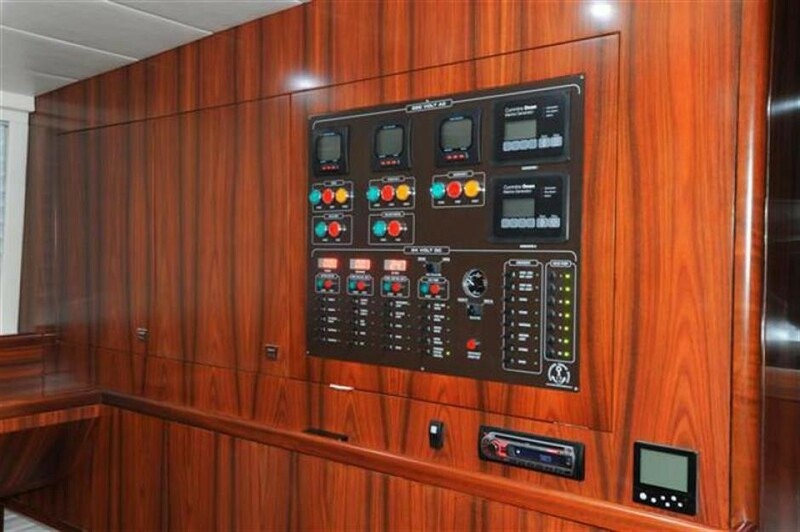 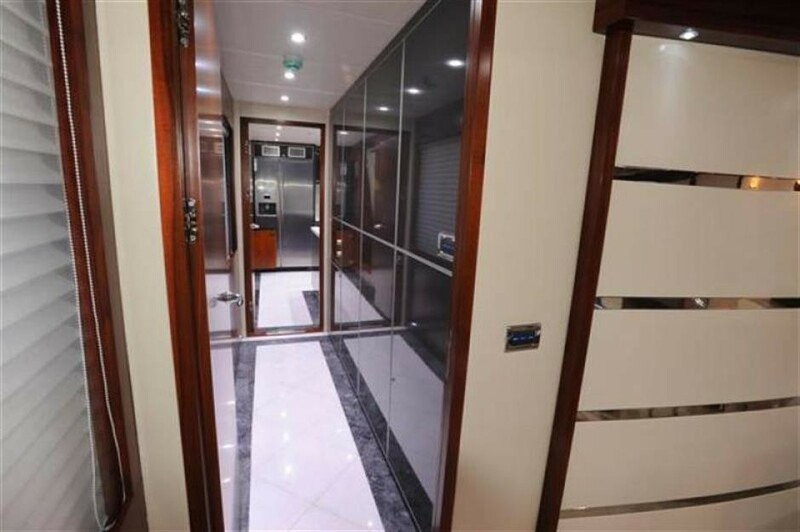 A VIP cabin is on the main deck forward of the salon, via a private entry hall and features a full beam layout, with a center lined double bed, sofa, vanity, walk in wardrobe and en-suite with a luxurious tub. 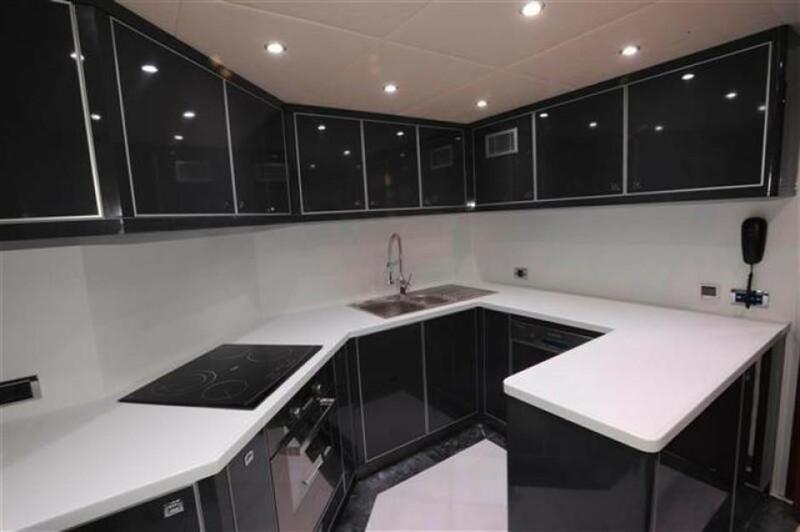 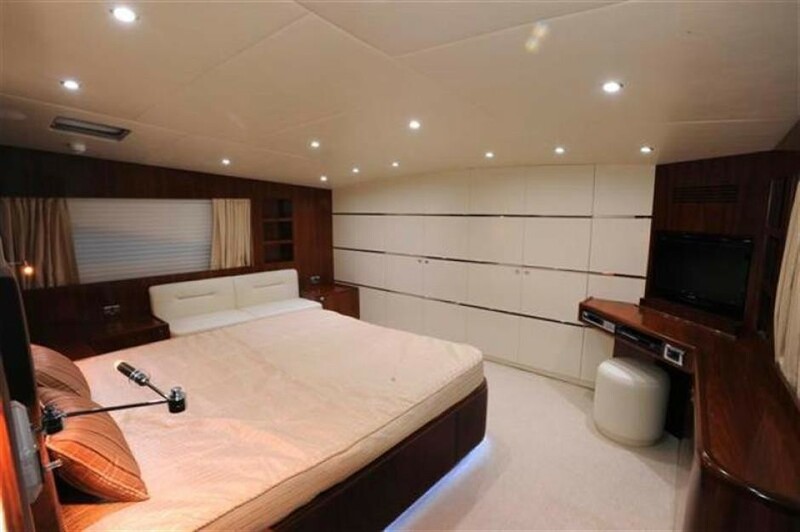 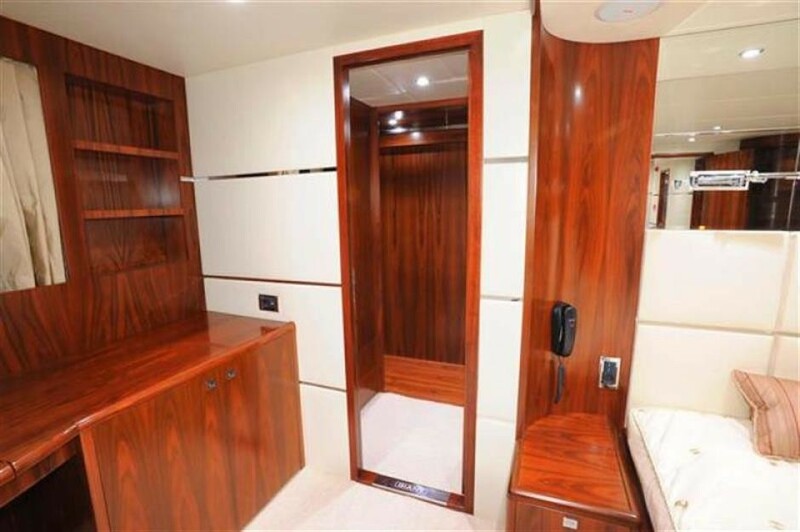 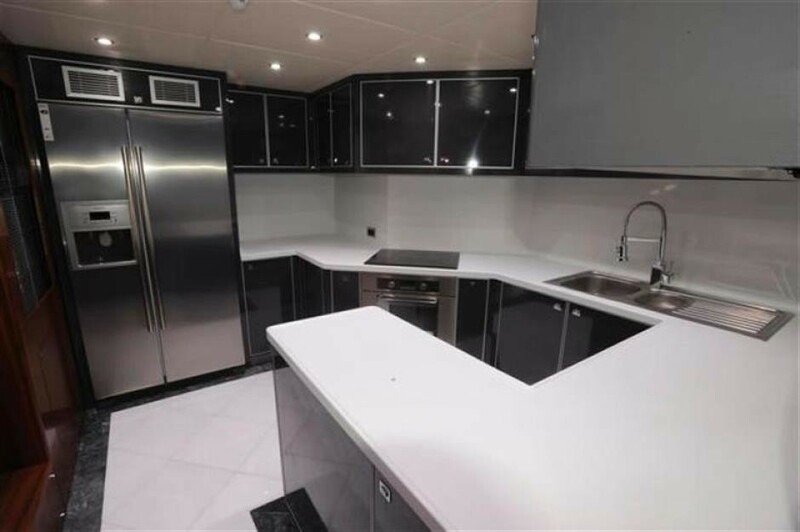 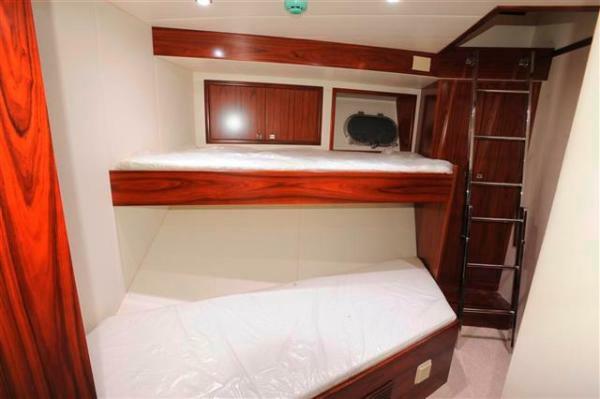 Below decks and amidships, the full beam master stateroom offers a center lined double bed, sofa, vanity, walk in wardrobe and en-suite with luxurious tub, plus his and hers sinks. 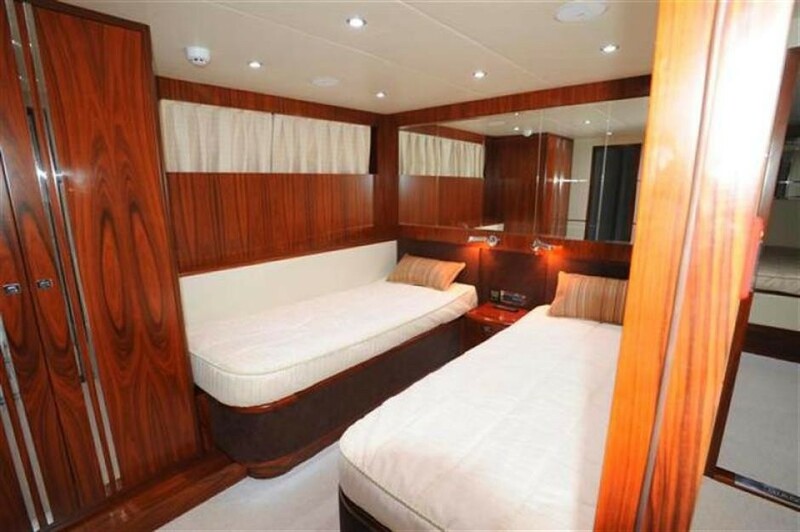 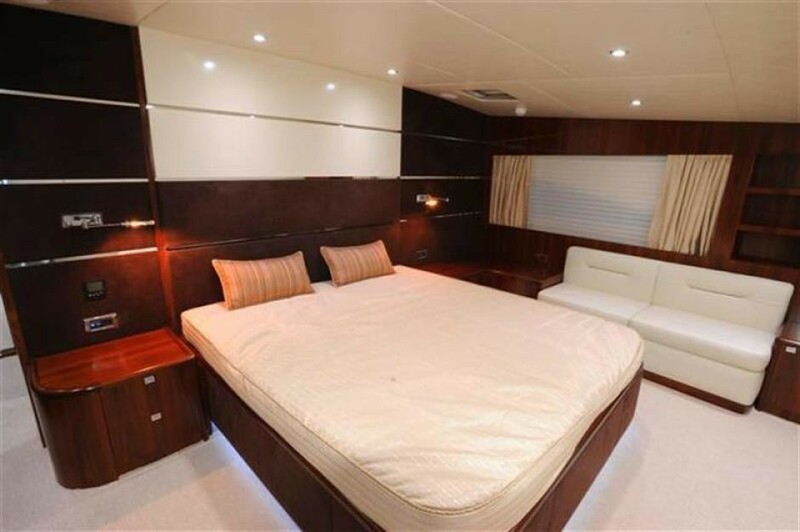 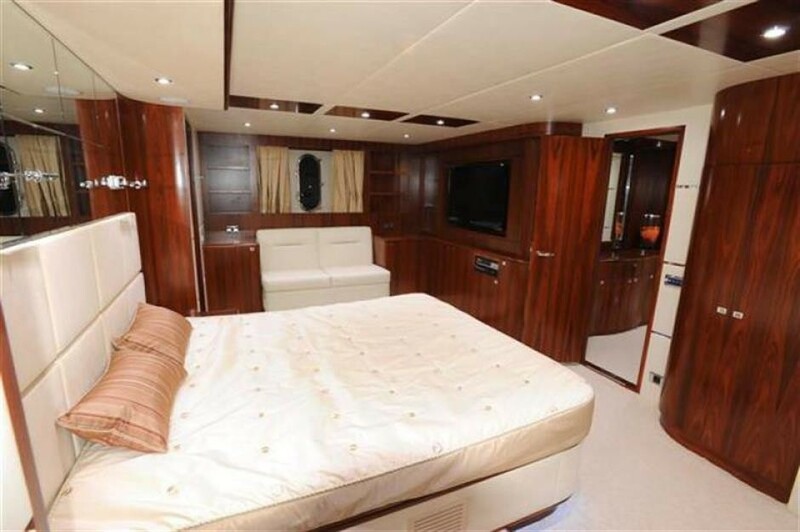 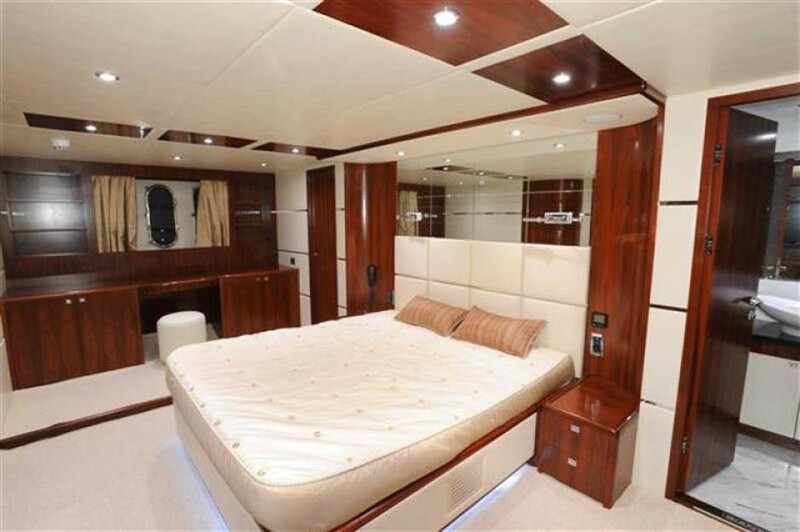 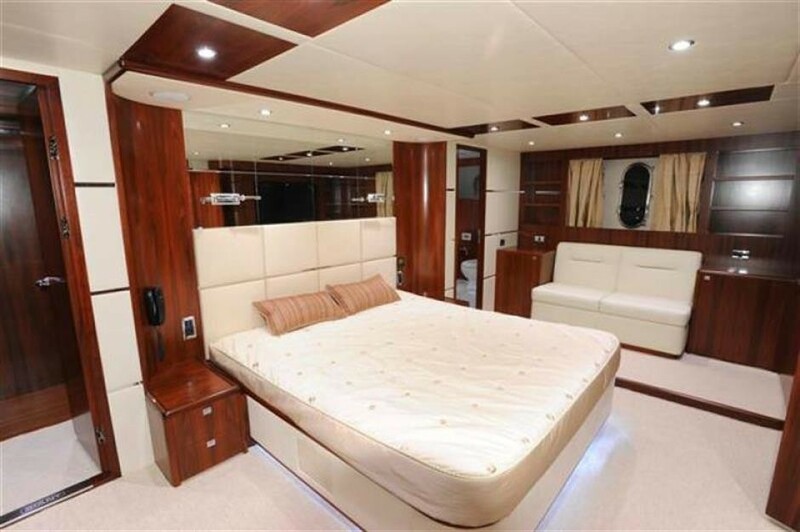 A guest double is forward and full beam of the yacht with a center lined double bed, sofa, vanity and en-suite with shower. 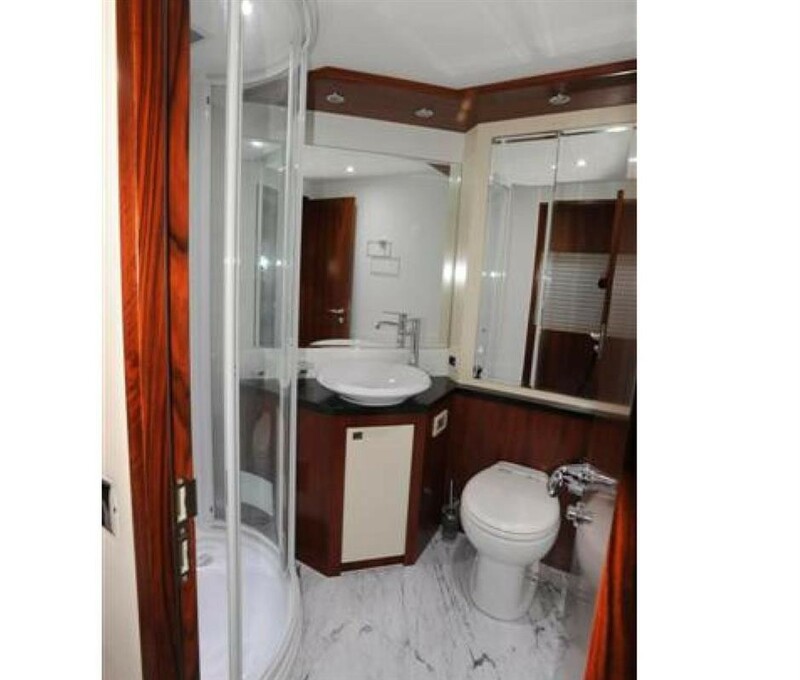 A further 2 guests cabins are on port and starboard, featuring side by side single beds and en-suite facilities with showers.